One of the city’s oldest, the bustling KR Market is a made up of countless stalls and street vendors, hawking everything from strings of jasmine to dumbbells. 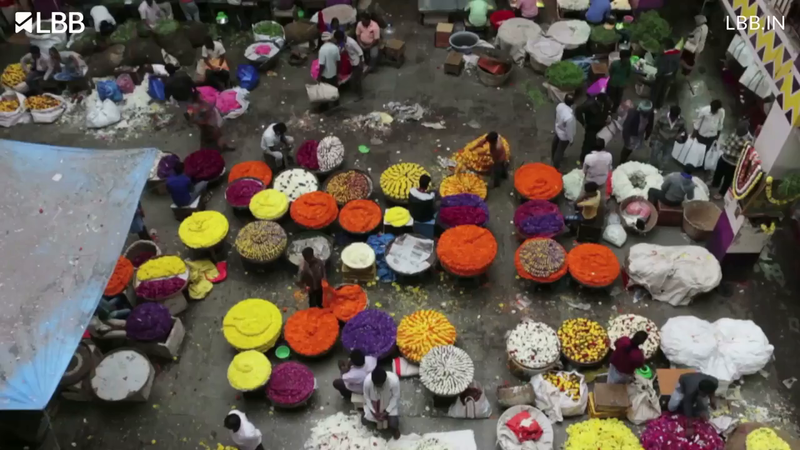 The flower market is touted to be one of Asia's largest! One of the city’s busiest areas, Krishnarajendra Wodeyar Market or KR Market, as it is better known, is great for a morning of exploration, selfies, and grocery runs. It is believed that the KR Market area was once a water tank and then a battlefield (Tipu’s Summer Palace and the Bangalore Fort are close by) before it was converted into a marketplace. We recommend you get there in the wee hours of the morning, with your camera in tow. As early as 4am, the market area (around the bus stand) is taken over by flower vendors, from near and afar. The streets and bylanes are lined with flower sellers showcasing everything from budding orchids to endless strings of fragrant jasmine. You can also pick up roses of every hue, carnations, and local blooms. Needless to say, the flower market is popular with the cities photogs and Insta lovers. After a quick brekkie (you can hop over to one of these places) come back with your grocery bags. The fresh veggies market here sells seasonal produce and many a time you’ll be directly buying from a local farmer. Plus, the prices are a quarter of what you’ll be paying at the supermarket near home. At the back of of KR Market (down the road from the Chickpet Metro Station), you can find street hawkers selling a host of stuff crafted from metal. If you are a workout junkie, you can pick up second-hand dumbbells and other equipment. This also a great place to pickup dirt-cheap electronics like emergency lamps and lights.